Knitters Pride Nova Cubics Platina Interchangeable IC Special Tips are designed to produce circulars in 16" (40cm) length. Each tip measures 4" (10cm) and is to be used with cord of 8" (20cm) length. 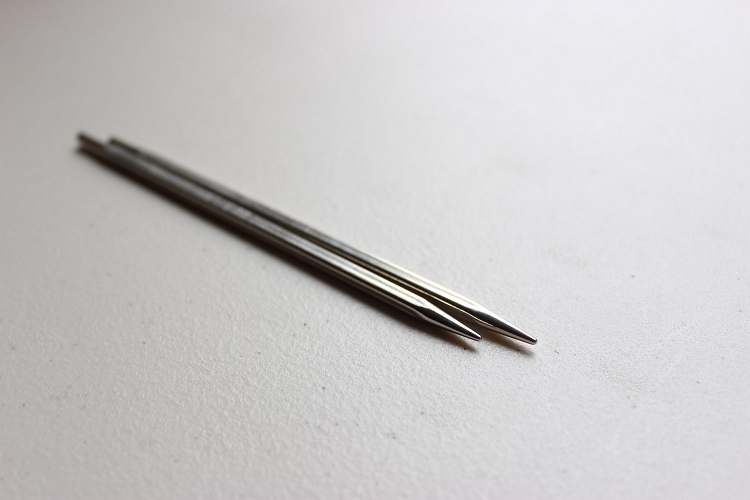 Knitter's Pride Nova Cubics Platina – the best & most affordable interchangeable metal needle. Q: Sorry, another ? on same. Lable at page top says 3.5 inch long but Description says 4", even specifies 2 x 4" tips+ 8" cord makes 16" circular ??? 1" length difference x 2 could be worth the price, 0.5" difference, not so much. Please clarify? Thank you so much! All fixed. They are approximately 4 inches long. Thank you for letting us know. Q: Do the special short tips fit the standard cords or do they require special cords/joins? Yes, they fit all of the KP cords, nothing else is needed. Q: What is the difference between the Original Cubics and the Nova Patina Cubics?